14 Therefore, I will now allure her, and bring her into the wilderness, and speak tenderly to her. 15 From there I will give her her vineyards, and make the Valley of Achor a door of hope. There she shall respond as in the days of her youth, as at the time when she came out of the land of Egypt. 16 On that day, says the LORD, you will call me, "My husband," and no longer will you call me, "My Baal." 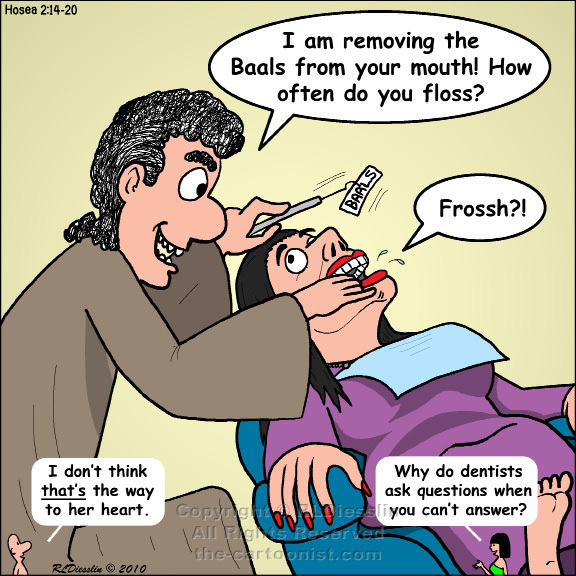 17 For I will remove the names of the Baals from her mouth, and they shall be mentioned by name no more. 18 I will make for you a covenant on that day with the wild animals, the birds of the air, and the creeping things of the ground; and I will abolish the bow, the sword, and war from the land; and I will make you lie down in safety. 19 And I will take you for my wife forever; I will take you for my wife in righteousness and in justice, in steadfast love, and in mercy. 20 I will take you for my wife in faithfulness; and you shall know the LORD. Hosea is a very interesting prophet with a very unusual way conveying his message. He is called by God to be a prophet, to marry a harlot and to the name his kids with symbolic names (such as Lo Ruhamah "no mercy" and Lo Ammi "not my people"). The idea of Israel acting the harlot wasn't new (Jeremiah 3 for example), but actually living it out was. (The kids probably weren't too happy about it either.) That aside, this passage is calling Israel back into faithfulness to God - if they comply their relationships will be restored. God stands as the wronged husband willing to forgive and take back his unfaithful wife (Israel) and children (the Israelites) and make things better than they were before. It will lead to a "happily ever after" ending. Politically Hosea is suggesting Israel allying with Assyria is bad (part of why they are unfaithful) and Aram (Syria) is good.